Nukiya Mayo scored 20 points, Kionna Jeter added 10 and each drained a clutch jump shot in the final minute as Towson rallied late to defeat Drexel 53-49 Saturday in the Colonial Athletic Association championship game, earning the program’s first berth in the NCAA Tournament. NEWARK, Del. 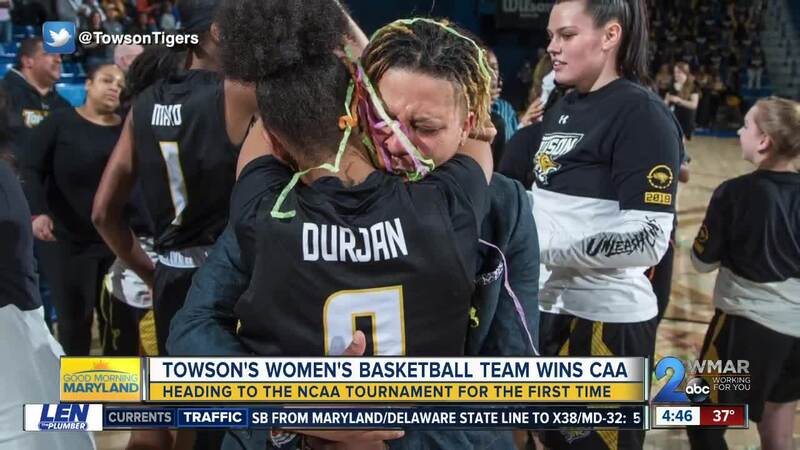 — Nukiya Mayo scored 20 points, Kionna Jeter added 10 and each drained a clutch jump shot in the final minute as Towson rallied late to defeat Drexel 53-49 Saturday in the Colonial Athletic Association championship game, earning the program’s first berth in the NCAA Tournament. Drexel walloped Towson by 33 points in the regular season finale a week ago. After ending the conference season with three losses, the Tigers take a three-game win streak into the program’s first NCAA appearance. A construction crew on the University of Delaware campus severed an internet line just before the game, “which sent us back to 1995,” said CAA assistant commissioner Bill Potter.